Yes, we need to kick fundraising in to gear–we’ll announce more fundraising activities at our Earth Day Celebration (and here and on Facebook, if you can’t make it out this Saturday)–but we’re hopeful this will help get the funding completed. So this Saturday, we’re kicking off our BIG Raffle. The Grand Prize is $2000, plus there will be five $100 Winners. 100 tickets maximum will be available, each at $50 each (numbered 00-99). 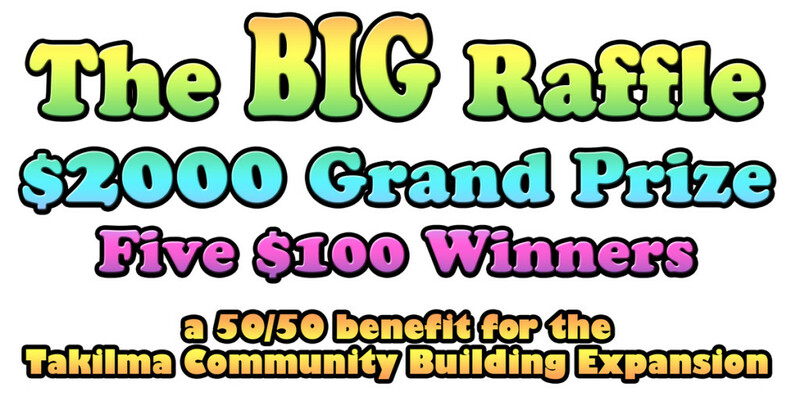 Assuming we sell all tickets, that will be $2500 in prizes and $2500 for the building expansion. And we have decided to award all prizes provided a minimum of 50 tickets are sold. (If less than 50 tickets are sold, all ticket sales will be refunded.) So, yes, if we only sell 50 tickets, it will be a 100/0 raffle (100 in prizes, zero to the school). This just seems easier than giving everyone’s money back if we only sell 50 or 60 or 80. Hopefully we sell all and this makes the $2500 for the school. Fingers crossed! The Drawing will be held Saturday night, June 24, at the Hope Mountain Barter Faire (just prior to the headlining act). Prizes can be collected at the Barter Faire, or following Barter Faire at the Dome School office (call to make sure we’re open–we have limited hours in the summer). Tickets can be purchased at the Dome School office during school hours (9am-3pm Mon-Fri, through May; more limited hours in June). Tickets are also available Fridays at the CJ Farmers Market (if you don’t see a Dome School booth, look for market manager Sarah Kuhn) or from any member of the building expansion committee. We’ll update right here if we add locations around town where tickets can be purchased. For more information, please call 541-592-3911.